So you think people who watch TV or play video games are couch potatoes? You must not have heard about UltiMotion Swing Zone Sports developed by Jakks. For the ultimate interactive sports, UltiMotion allows you to get your hands on some of your favourite sports. The package comes with a white console, a wireless motion controller which can detect the timing of your swing or throw, and five plastic snap-on accessories for bowling, tennis, football, golf and baseball. The motion controller consists of a wireless three-axis accelerometer, the latest trend in gaming technology, and plugs easily into any standard TV. 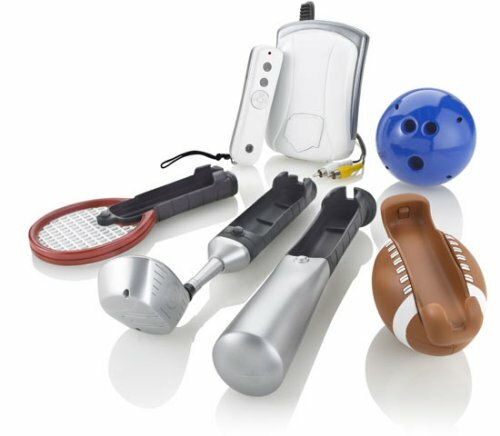 The snap-on accessories are in the shapes of a bowling ball, a tennis racket, a football, a golf club and a baseball bat. The accessories help to replicate the thrill in a real sports game. In addition to swinging, jumping or moving the handles around, gamers will also see characters replicate their movements on screen. UltiMotion Swing Zone Sports is priced at $80. 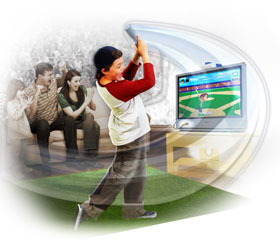 It is a great value sports video game system for every family.